—Anon (Gillian Serisier), 2015, ‘Superlux: smart light art, design and architecture for cities’, Inside (Interior Review) (Read), August, p. 18. —Anon, 2015, ‘City of lights‘, Wired UK (Playlist: Play), September, p. 74. —Davina Jackson, 2015, ‘Smart lights, brighter cities‘, The Australian Financial Review (Weekend Fin), 29-30 August, p. 449. —Kristian Kloeckl, 2016, ‘Superlux: Smart Light Art, Design and Architecture for Cities’, Journal of Architectural Education (Book Review), 70.1, pp. 175-77. —Andre Tammes, 2015, ‘SuperLux: Smart Light Art, Design and Architecture for Cities‘, InDesign (Evolve), No. 63, p. 48. —Anon, 2015, ‘SuperLux launch party – Sydney celebrates a new era for night arts‘, InDesignLive AU, 25 August. 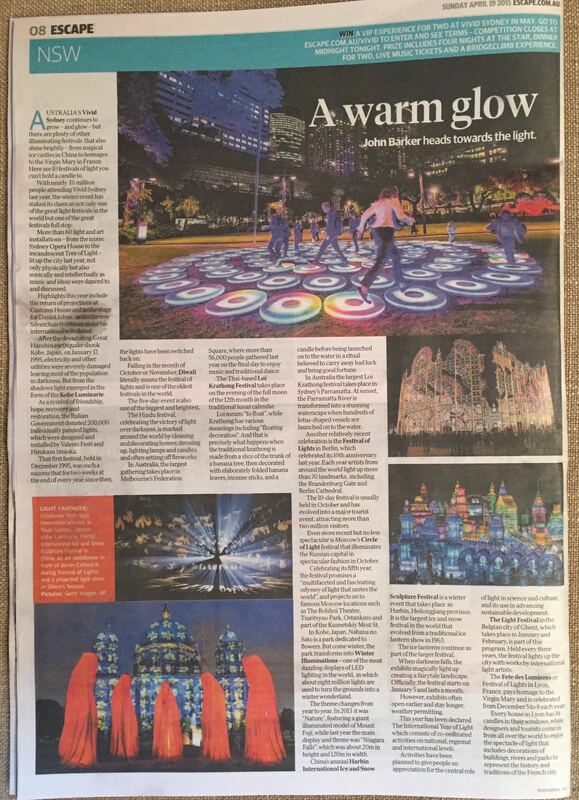 —Office of the Lord Mayor (Sydney), 2015, ‘Customs House transformed into a bright twilight garden‘, City of Sydney (media release), 9 September. 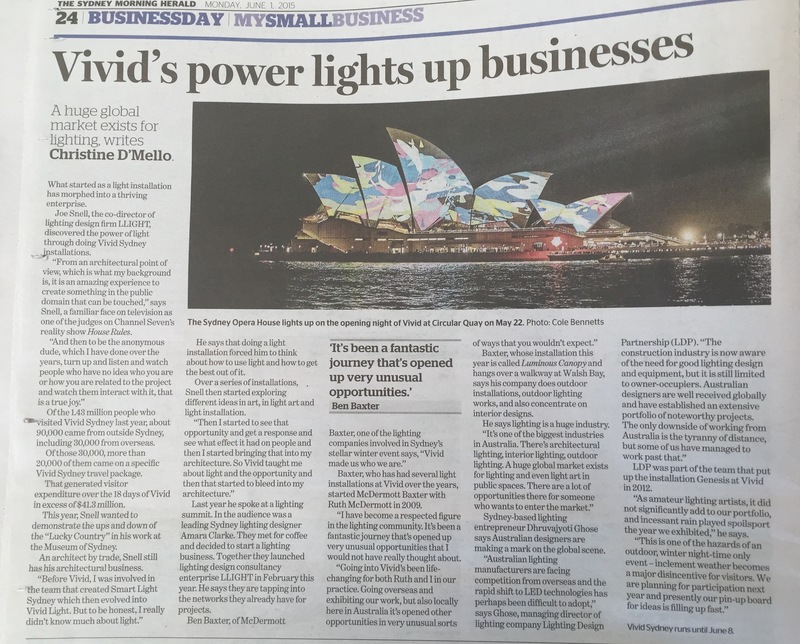 —Christine D’Mello, 2015, ‘Vivid’s power lights up businesses‘, The Sydney Morning Herald (Business Day: My Small Business), 1 June, p. 24. 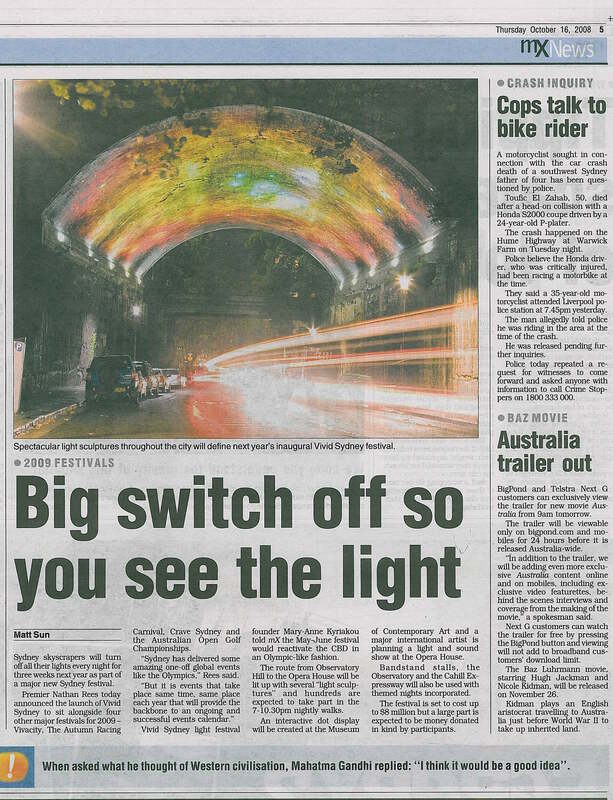 —Matt Sun, 2008, ‘Big switch off so you see the light‘, MX, 16 October, p. 5.